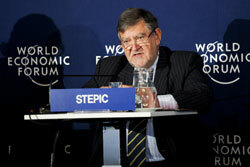 Today, Herbert Stepic announced his resignation as CEO of Raiffeisen Bank International (RBI) due to personal reasons. Stepic became a target of heavy criticism after he had purchased three apartments via offshore companies but not informed the committees about the deal. The supervisory board of RBI has announced – as has the Financial Market Authority – to look into the deal. Even Govenor of the Austrian National Bank (OeNB) Ewald Nowotny will assess the business. This article includes a total of 243 words.